The military situation in Chechnya is a nebulous subject, and because of the lack of reliable information we can only make rough and hypothetical guesses about the true situation. Ramzan Kadyrov’s promises to “put a quick end” to the armed underground are no longer taken seriously even at government level. Openly ignoring Kadyrov’s wish to stop all talk about war, in their communiqués the law enforcement agencies increasingly focus on what appears to be an unprecedented rise in the number of attacks and acts of terrorism, and the rapidly deteriorating situation in the republic. Alas, the reports that emanate from the websites of the Caucasus Emirate and those associated with it cannot really be considered suitable for analysis. The propaganda element in them is so strong as to make it impossible to distinguish fact from fiction. That is why reports in which the facts can actually be discerned are so important. On February 5 a battle between Russia's special forces and the Chechen mujahedin took place in the foothills near the village of Alkhazurovo. It was no ordinary event. A complete reconstruction of the clash is hardly possible since Russian media reports are based on information from the state-controlled law enforcement agencies, and they are rarely objective in describing the fighting. However, even the available reports are sufficient to allow us to draw definite conclusions about the capacity of the Chechen armed insurgency. The most complete version of the events appeared in the Kommersant newspaper. At first glance, this unambiguous report raises a huge number of questions. It appears that on February 4 Kadyrov's militia discovered “a group of a dozen militants” between the villages of Dacha-Borzoi and Alkhazurovo. According to Kadyrov, six of them were killed. Next, the story takes a strange turn. By Kadyrov’s figures, nine insurgents ought to have survived. Since we know that Kadyrov's forces are being poured into the foothills and mountainous regions in their tens and hundreds (they do not take the risk of showing themselves there in small numbers), a group of nine does not seem a force so formidable that it would require the involvement of additional units to destroy it. Nevertheless, the report goes on to reveal that the very next day Russian interior ministry forces, mainly spetsnaz troops from Bashkortostan, were brought in as reinforcements and to some extent replacements. Quite why these “well-trained and experienced soldiers for whom this spell of duty in Chechnya was not their first" (to quote the head of the army press service, Mikhail Ponomarenko), went after a rather worn-out detachment of mujahedin is not made clear. Then there is something really quite inexplicable. The insurgents, who had spent the night in the forest in sub-zero temperatures, did not even try to evade their pursuers. Nine men who the day before had taken part in a battle which ended in their losing nearly half of their unit, somehow managed to "break up into several small groups" and "organize an ambush”. This looks like a hastily concocted fib which no one bothered to check for its improbability. The only indisputable fact is that five spetsnaz commandos were killed, and seven, including officers, were wounded. What is more, the outcome of the battle suggests that there must have been rather more insurgents than the nine claimed by Kadyrov. The significant losses sustained by the spetsnaz forces were a result of the attack, even though it was only an ambush. 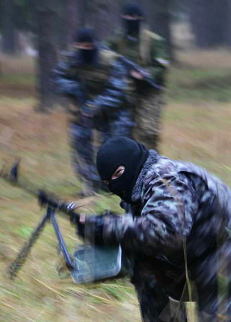 Kommersant’s article also notes with ill-concealed surprise that "the rebels even managed to neutralize the sniper who was covering the commandos.” This can only mean that the military action took place not in a confined space but in a larger area, since a sniper usually occupies a position far removed from the group for which he provides cover. If this were so, it would be logical to assume that the insurgents had the advantage. But we can assume anything we want – the truth will remain hidden. We must make do with the assumption that what really happened was not just different, but very different. I shall mention on February 5 there were no reports of casualties among Kadyrov’s forces. This in itself gives us reason to doubt that they took part in the second day of the operation. In my opinion, the battle near Alkhazurovo is eloquent testimony to the mobility and activity of the insurgent groups. Whether Kadyrov’s forces fought them or not, whether the Russian commandos were pursuing them or just happened to run into them – none of that really matters. All that is clear is that this winter the Islamic insurgents have demonstrated their ability to attack Russia's special forces and inflict serious damage on them.